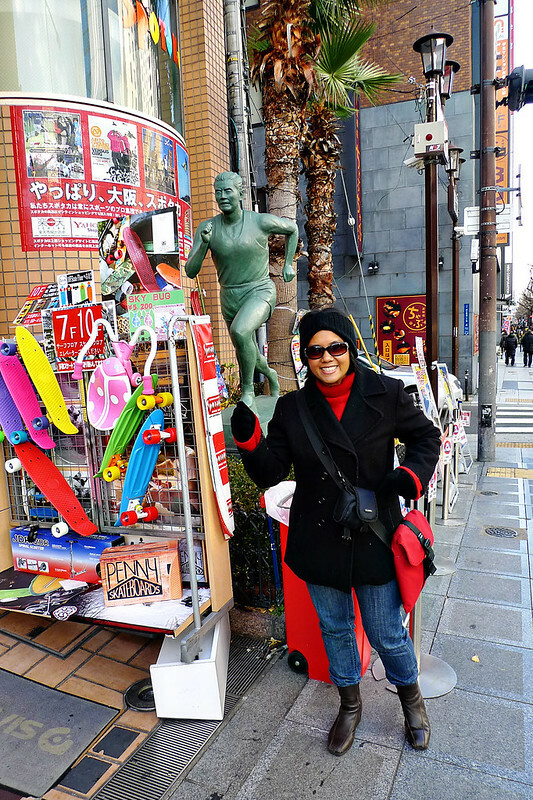 Let’s check out Osaka’s shopping scene for the runner in all of us. After a few days in Tokyo, we waved sayonara to the capital city and made way eastbound for Osaka, about an hour and 15 minutes away by flight. Friends back home asked us if we took the bullet train to get there, which apparently takes less time than flying! Obviously we didn’t. However we did get a unique glimpse of Mount Fuji from the air. After arriving at Kansai Airport, we were whisked to our hotel located in the relatively young commercial area of Rinku Town, which was built on reclaimed land in 1994. We learned quickly that the town is known as a premium outlet haven, though during weekdays it was a bit on the slow and quiet side. In addition, we were staying about 50km away from the main pulse of Osaka itself, which meant we had to catch a train from Rinku Town and spend an hour on it before we got there. 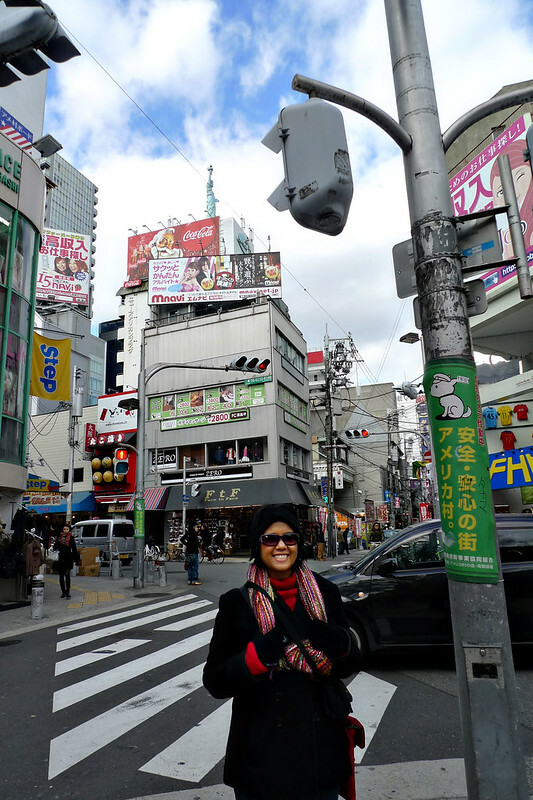 Let me bring you on a journey to some of the sights and shopping outlets I encountered in Osaka – most of which are are bound to make any runner’s heart rate spike with excitement. This sports outlet located about 10 minutes walk away from our hotel in Rinku Town (the Kansai Washington) literally made my jaw drop. The selection of items was simply ridiculous; I had never seen so many variety of sportswear, whether you were into shoes, compression wear, tops, bottoms, sweatbands, baseball gear, you name it! Since it was winter time there was a lot of winter clothing for sale, stuff I couldn’t bring myself to buy – but the diverse selection of patterns and colors alone would make purchasing worthwhile if only I ran in colder climates. I definitely would recommend you to check out this humongous store if you’re ever in Rinku Town, you can’t miss the green building it’s in, just opposite the Rinku Town Seacle shopping mall. This isn’t really a runner’s specific attraction or anything, thought I’d just mention about this rather unique spot in the city. “Ame-mura” for short, Amerikamura is literally “American Village,” a shopping enclave located near Shinsaibashi-suji (another deliriously awesome shopping avenue). You guessed it, most of the shops and eateries here pander to those, especially the young, with an affinity for all things American. I went through this part of Osaka unplanned and rather in a daze really, because I was hunting for halal food (which I found at Hafez). Fairy at Amerikamura – do you see Lady Liberty at the top? So “American” is Ame-mura, it’s got its own Statue of Liberty. Who needs to fly to New York to go check out Lady Liberty herself, eh? On my way to Ame-mura, I saw the Nike Osaka boutique shop at the corner of an intersection with its catchy billboard featuring caricatures of Japanese runners. I did drop by and noted that they had the Nike ID service where you could design and customize your own Nike shoes. Now on my quest to find halal food, I passed by this sports shop, which I merely glanced at the time because I was so hungry and in a rush to fill my growling tummy. But I did make a point to come back and was I glad I did. Spotaka in Osaka, a great shopping center for sports lovers! Spotaka was literally a 10-storey building that is bound to make any sports-practicing person go berserk. Every floor catered to a specific type of sport (my favorite was of course 3rd floor but the other sections were equally tempting). The floor directory at Spotaka in Osaka – delish! I saw many things inside Spotaka that would make any running-loving person just explode out of their minds. Here are just some of the cool things which I saw. Tokyo and Osaka Marathons 2012 memorabilia – someone’s been busy! I thought this body building section was cute – it’s got an old poster of Governator! Japanese sports nutrition – reckon they’ve got seaweed as secret ingredient in there? I discovered this iconic advertising billboard of Osaka City quite by accident; I was coming out of Spotaka when I saw it across the street. Excited by the discovery, I wasted no time in snapping a photo in front of it, mimicking the pose. 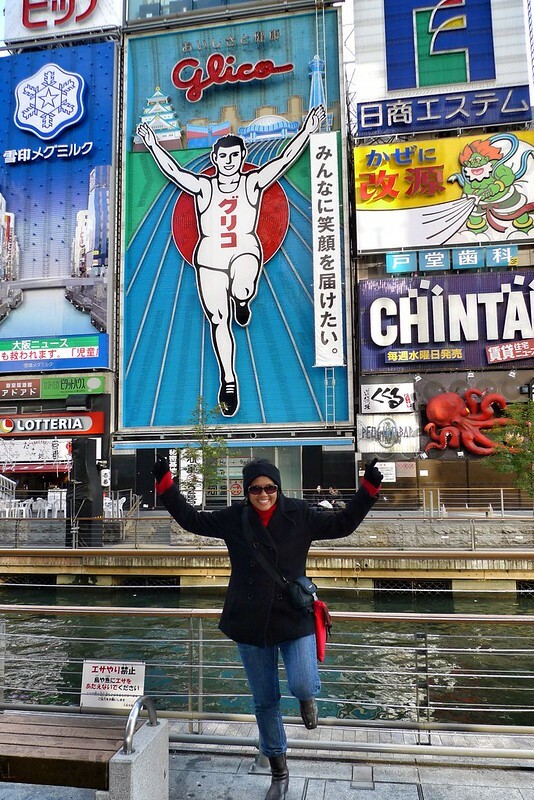 Now who or what exactly is the Glico man and why is he running? Ironically the running man is a logo for a local candy confectionary (you might know Pocky) who apparently is running 300m with a background featuring some of Osaka’s famous landmarks. Not far from this big neon billboard, you’ll encounter a mini version when you walk along the eateries area in Dotonbori. Inside the souvenir shop where this mini Glico running man is located, you’ll find lots of items bearing the running man. Despite its seemingly less than healthy association to candy, Glico “strives to offer consumers products that helps them maintain and enhance their health and beauty.” Also, one Glico caramel apparently contains 15.4 calories, the amount you burn when you run 300m. 4pairs, but we buy 18000 pairs /year. Sorry Renato, I am not a shoe seller. Perhaps you can get in touch with Mizuno Corporate on this. Came across your blog when I was looking for “running stores” in Osaka. A friend of mine spoke about “Spotaka” but wasn’t really sure about the name. Great to know you are into running too! I’m from Sabah and an avid runner as well 😀 I’m planning to splurge on some running gear while I’m in Osaka and was wondering which store offered the best prices?Also, did Spotaka offer a bigger variety of running gear than Sports Depot? Sorry for bombarding you with all these questions! I can’t quite remember which store offered better prices, Sports Depo or Spotaka. But in terms of choices, you will be quite spoilt so I suggest going to both if you can! I can’t recommend stores for hiking as I didn’t really look out for those. But if you’re in KL there is a new shop opened today in Nu Sentral mall called Eiger, it’s an Indonesian brand which is quite established and popular among hikers and trail runners. Hi Fairy..nice and very informative..great for runners coming over to Osaka especially with this weekend event.I wish I’ve discover spotaka while i’m in Osaka before..i only been to Rinku outlet and Sport Depo.